Around Thanksgiving in 1989, General Motors announced that they would be closing the van plant in Scarborough, Ontario, and awarding the van contract to Flint, Michigan. On May 6, 1993, production ceased, and the process of dismantling the plant began. By the end of July there was almost nothing left to mark the passage of thousands of people, and the history of a vital, close knit, caring, community. Steam Whistle Brewing has been hosting monthly art exhibits since 2001 and this month’s exhibit is a tribute to the General Motors plant community. The opening reception will take place at the brewery on September 14thfrom 7:00pm-11:00pm and will be on display during regular brewery operating hours until September 30th. The exhibit mainly draws on the van plant photographs, but also includes others, which were shot on earlier occasions, at parties, pares, and events. Its purpose is to give a human face to the jobs that were lost, to present the intangible losses that cannot figure in economist’s charts. Most important is that this plant closure be seen not as a displacement of 2800 jobs, but as the displacement of the 2800 people who worked them. It is also important that attention be paid not only to the economic tragedy, but also to the disruption and loss of the community, which was so important and vibrant a part of their lives. "I keep remembering that a while after I first started here, my girlfriend and I broke up. I was pretty upset about it, and one of the older guys that I worked with said, 'don't worry, after 20 years you might be with your 2nd or 3rd wife, but you'll still have the same co-workers. And I keep thinking, he was right, I've worked here for 19 years, and there are guys that I've worked with all of that time that are with their 2nd or 3rd wives, but they still have the same co-workers, in fact, I still work with that same guy. Tomorrow, it's over” states Glen Seidman, former plant employee. 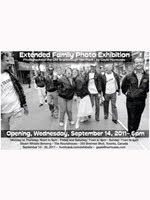 Join us for the Opening Night Reception Wednesday September 14 2011 from 7-11 pm. Steam Whistle Brewing, The Roundhouse, 255 BremnerBlvd.,Toronto or visit the brewery all month long to check out the exhibition.